Suddenly and thankfully I find myself cherrypicking and attributing a lot of coins for the first time in more years that I can remember! Of course I plan to submit the majority of what I believe to be new finds to James Wiles for listing. How wonderful it is to be reborn! Put me amongst a bunch of coins and I’m going to find something! 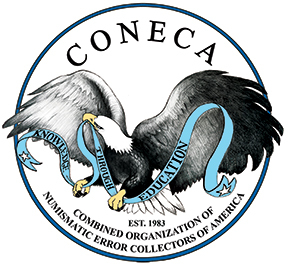 In the process, I have been elated with the use of the CONECA On Line web site ( www.conecaonline.org ) master listing of 20th Century Die Varieties which James Wiles has worked untiringly to make available to us all. The benefits of using this FREE listing are immeasurable. However, when asking myself what would make it better, I thought it would be nice if all of those pictured in Errorscope were indexed here so we could look them up to better attribute our finds. Well, I finally found myself thinking “I NEED that feature now!” So, I just dropped everything I was doing and did it! And, I knew right away I had to share it with you all. It has been awhile since I have been able to contribute much to the club and I thank God to have the ability now. – An article about San Francisco mintmark styles of 1941-1949 on all denominations by Bill Fivaz and is found in Volume 9, Issue 1 on pages 17-19. – An article about San Francisco mintmark styles of the entire Lincoln cent series by James Wiles and is found in Volume 6, Issue 6 on pages 8 and 9. – An article on inverted “S” mintmarks by Obie Huffman (deceased) is found in Volume 6, Issue 5 on pages 8 and 9 (Note: Most everything in this article was incorrect including the attributions by PCI of the Mintmarks as being Inverted; the information in the article was debunked by James Wiles one issue later in Volume 6, Issue 6 on pages 8 and 9 as noted above). 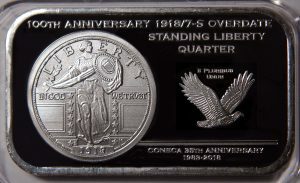 – An outstanding article on Washington quarter reverse design varieties from 1932 to 1972 by James Wiles and inspired by the research of Herbert Hicks is found in Volume 11, Issue 1 on pages 20-23. Reverse Design Varieties are now listed numerically. Just convert the letters to numbers. 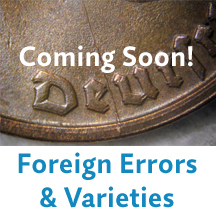 – Last but not least is a series of articles with tons of wartime alloy Jefferson nickel RPMs. Most, if not all, are in James Wiles’ “Jefferson Nickel RPM Book.” If you do not have that excellent reference then this series of articles, also by James Wiles, will be like a gold mine of information for you! They can be found in Volume 7, Issue 4, pages 26-27; Volume 7, Issue 5, pages 26-27; Volume 7, Issue 6, pages14-17; Volume 8, Issue 1, pages 22-23; Volume 8, Issue 2, pages 14-15; Volume 8, Issue 3, pages 10-11; Volume 8, Issue 4, pages 26-27; Volume 8, Issue 5, pages 28-29; and Volume 8, Issue 6, pages 26-27. I have not incorporated these RPMs into the index. I hope you find this small project of some benefit. It feels good to be able to present it to you! Happy picking!